Herr Uwe Meier ist zwar schwer zu finden auf der Seite, verkauft aber einen Teil seiner Sammlung, wie dort zu lesen ist .... sehr cool! Da fehlt mal so einiges. Immerhin gibt der Autor zu, dass die Liste doch arg US-zentriert ist. Die Recherchearbeit ist der Hammer. Die beschriebene Vorgehensweise hingegen war dem Interessierten aber wohl eh klar. Schöne Seite mit hauptsächlich amerikanischem Geraffel der Zeit um 1960. 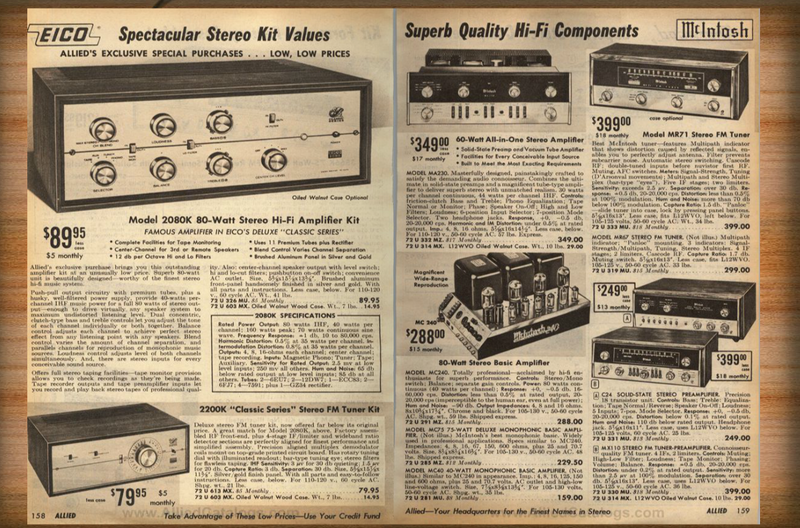 Komplette Jahrgänge der Zeitschriften Audio, High Fidelity und Hifi Stereo Review aus den Jahren 1952 - 60 als PDF. Die Zeitschriften können nach Schlagwort durchsucht werden. ...hatten wir die schon? Interessante Tröten-Auflistung. Ben Duncan - High Performance Audio Power Amplifiers. Lange vergriffenes Standardwerk zu Sinn und Technik. Liegt hier immer neben dem Bett. 1.3 What’s special about audio ? The amplifiers in this book are about reproducing music but they are equally applicable to the amplification or reproduction of speech, where the highest qualities and nuances of the living voice are of importance. These include religious and spiritual ceremonies, plays, poetry and chant. What’s special about all of these – all really variants of music – is that they involve sounds that make direct contact with powerful, pre-verbal centres of the human mind, affecting conscious states, ultimately in the higher direction of ecstasy  . Music is not just ‘the art that the other arts aspire to’, but it is in there with the highest, most transcendent mind events that can be experienced by human beings. The human eye and ear are both amazing for the range of levels, or dynamic range, over which they can resolve differences and operate without damage. The range in both cases is up to at least 1000 million times (160dB). The eye can perceive a single photon. The ear can perceive the result of air moving over a distance equal to the radius of a hydrogen atom, the smallest building block of all matter in the cosmos. Of the two, listening is humankind’s most wideband sense, spanning 10 octaves. Whereas everything we see is compressed into just one octave of light! The reproduction of music is a multi-dimensional event. Music involves instantaneous changes in Sound Pressure Level (SPL). The listeners’ instantaneous perception of musical values depends on what has gone before. The changes are driven by two things that have no physical reality – the way music is structured in time and in pitch. As these two are not causally related, and the sound already has a ‘where’ (humankind’s everyday 3D co-ordinates), at least 5 dimensions must be involved [4,5,6]. As we live in lower, four-dimensional space-time (3D = 3 dimensions of space, and 1T = one dimension of time), the human brain is not able to ‘see’ the whole picture, only segments at a time. This broadly explains why the traditional scientific method has been so badly dented by its attempts to prescribe the optimum means of music reproduction. It is important for all sound system users to be aware that music’s subtler qualities and intended communication may be restricted or even prevented when an amplifier damages or twists the signal which represents (is an analog of) the music. To ‘damage’ and to ‘twist’ are forms of distortion. There are many names for the different ways in which this can happen. Some ways are blatant, others subtle. When music is distorted, it not only looses it subtler essence; it can also hurt physically. Undistorted music, even at extremely high peak SPLs, as high as 140dBCSPL, is not painful to engaged listeners and will not immediately harm healthy ears. The majority of hearing damage is mainly caused by, or greatly exacerbated by, industrial and urban noise. Explosive and percussive sounds can have instantaneous levels that are 20dB (10x) above what ordinary SPL meters and acoustic spectrum analysers capture. The likelihood of any short or long-term hearing impairment is greatly exacerbated by distorted sound systems. Inadequately rated or designed power amplifiers are just one contributor to this. A significant number of people (possibly 0.1% of the population – which makes several million worldwide) have unexpectedly sensitive hearing. Compared to the average figures reeled off in acoustics and electronics text books, the perceptive ability of some individuals with music and chant, (not necessarily speech) extends up to ten times further out in audible frequency, pitch, harmonic content, signal delay, level or phase – amongst others. One example is that some people are as sensitive to 4Hz, a frequency often described as ‘subsonic’ (inaudible except through bone conduction), or strictly ‘infrasonic’, at one fifth of the frequency where ear hearing in most people ceases. Another is pitch discrimination. It has been noticed that some musically trained listeners can detect the difference between tones only 0.1% apart, up to at least 10kHz. This implies the human ear + brain combination is sometimes capable of resolving timing differences of around 100nS or a tenth of a millionth of a second. Such abilities are natural in some people, and learnt in others. Differences that are identifiable to some of these ‘golden eared’ listeners (and that can even cause involuntary physical reactions such as a feeling of sea-sickness) can correlate with differences in basic, conventional audio measurements of only 1 part in 100,000 or even less. Other differences may be just 1/30th of the immediately preceding signal, yet it has taken 10 or 20 years of discussion before they are measured; commonplace, simplistic measurement techniques with unrealistic test signals cannot ‘see’ them at all. Sensitive listeners, once they have self-confidence, will notice differences in music recordings they love and know well, when sound equipment is changed. After dismissing well established, simple reasons for sonic differences (such as a slight level mismatch causing the louder unit to sound brighter, a facet of loudness perception), the fact remains that what is judged to be sonically better nearly always reveals details and ambiences that were not previously audible. Moreover, nearly every audio amplifier is perceived by skilled listeners to have a sound signature of its own. Yet such basic technology as Hi-Fi is (presumably) assumed by the general public to have reached 99% of what is possible. Instead, the experience of the high-end should be warning us that what the public hear is probably barely 5 to 10% of what is possible, and the best systems are still pushing at the 50% barrier and all differ in their particular ‘bestness’. An amplifier – as our servant, and the speaker’s master, is not supposed to add or subtract from the performance. One of the worlds’ grandmasters of high-end amplifier design, Nelson Pass, reminds us that, past a point, there is no ‘best’ amplifier “... just as there is no best painting or best wine” . 1.7 Limits of 'objectivity'. Why listen? The traditional ‘brute force’ approach to overcoming individual sound signatures is to make conventional performance-indicator measurements very good so differences don’t matter, which presumes that what is being measured says all about what is heard. Loudly written specifications claiming ‘zero distortion’ or ‘ultra-low distortion’ has over the years tricked many millions of users into thinking the sound had to be good. This approach, known as ‘hearing with the eyes’ is still taken to extremes in obsessively technical, ‘hard line objectivist’ circles. Since the mid 70s, amplifier users who are confident in their aural judgment have increasingly learnt to trust their ears with little or no recourse to specifications and measurements, except to check and pass them for basic standards. Outside of electronics and the purely technical, the subjective approach to decision making is the norm on every level. An amplifier is not supposed to add or subtract from the performance. Yet if conventional measurements are all, then the audibility of some variations of the parts in amplifiers indicates that some human brain-ears are reacting to (as mentioned earlier) differences well below 1% (1 part in 100) and in some cases, 1 part in 100,000 or even less. To make sense of this without invoking the 4 spacial dimension, consider the ink in a book. The ink makes the 500 pages into 1 million words of knowledge. But it only makes the book weigh one gram heavier. If the book can only be analysed by weighing on scales, then the quality difference between it and another same-sized 500 page book on a completely different topic will be hard to measure. Humans who can ‘read’ may be detecting differences in ink weight of 1 part in 10 million. The order is implicate! Klasse! Da ist jemand mit viel Liebe zu unserem Altmetall dabei. Der Kenwood kommt in beste Gesellschaft. hängt ein Ebay Shop dran, trotzdem lesenswert.